When Army Staff Sergeant Amanda Henderson ran into Staff Sergeant Larry Flores in their Texas recruiting station last August, she was shocked by the dark circles under his eyes and his ragged appearance. "Are you O.K.?" she asked the normally squared-away soldier. 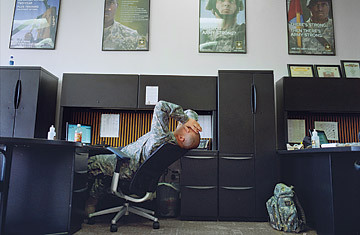 "Sergeant Henderson, I am just really tired," he replied. "I had such a bad, long week, it was ridiculous." The previous Saturday, Flores' commanders had berated him for poor performance. He had worked every day since from 6:30 a.m. to 10 p.m., trying to persuade the youth of Nacogdoches to wear Army green. "But I'm O.K.," he told her.